The air is honey crisp. The nights are getting chilly. It’s time to eat (pumpkin-flavored everything), drink (cider please) and be SCARY. We combed through all of our Halloween events to find zombie 5ks, ghost walks, and so many other haunts across the country. Here are our 13 top picks for Halloween events, ranging from entertaining and family-friendly to frightening af. The Sanderson Sisters have been resurrected as drag queens. In this Hocus Pocus staged reading, soak in the nostalgia of the childhood classic movie served with witchy drag realness. Let’s roll. Watch derby teams of all ages, from all over the region compete in a Halloween showdown. When you want to learn some new tricks and have some treats. Get schooled on how to make tantalizing confections in cute shapes–jack o’lanterns, black cats, and ghosts. Want to explore one of San Francisco’s most-haunted locations? In this 90-minute ghost tour, you will embark on a paranormal investigation. Halloween events don’t get much scarier than that. In this dinner theater show, experience the story of Magical Magician Professor Mandrake as he discovers what is making his cast and crew sense a ghostly presence. This concert features many local artists playing their spookiest tunes. Walk among gravestones, experience a haunted maze, and don’t die along the way. Then, if you make it through the evening, celebrate your survival and mortality with refreshments at an old one-room schoolhouse, circa 1826. 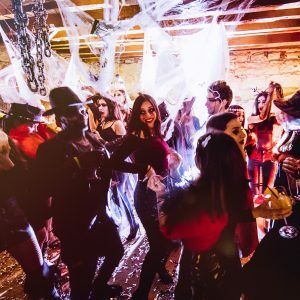 Halloween isn’t just for kids; barhop your way to a proper adult Halloween. Get aboard this bus and plan for a night of costume contests, tomfoolery, and spooky fun. Return to the theater for this classic film that became an icon of horror cinema. Your mission: survive the obstacles and zombies along this 5k course. Race against time and run for your life. Rock-n-roll joins the circus. Experience a gravity-defying night of horror, carnival games, and acrobatic feats including aerial bartenders. We aren’t kidding, this house is for-real haunted. Join the owner of the home on a paranormal investigation and see if you can reach the realm of the supernatural and come face-to-face with a ghost. At this all-ages event, come dressed in your best zombie prom attire and dance the night away to spooky tunes in a haunted venue. Proceeds will go to local community efforts for youth. If we had to list all of our Halloween events this post would be long af. Find more Halloween events and have a great holiday. Want to host a haunted shindig or a ghostly gathering? Get the pumpkin rollin’ and create an event. Remember, we have a dedicated promo team as well as 24/7 event support to help make yours the best Halloween event ever.